**All pirate shows include kids treasure map to search for the actual treasure on the lake with gold coin surprise, complimentary pirate themed face painting, pirate themed coloring, and toys on board. Complimentary tea/coffee/water self service facilities also. 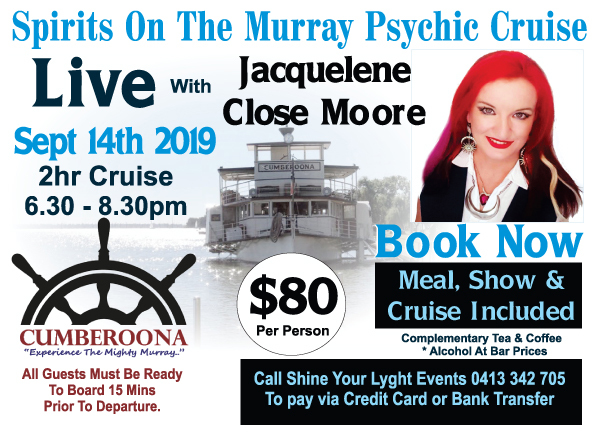 Who wants to join Shine Your Lyght for a fun night out, Reading, some spiritual, psychic chat and learning, and dinner with the show, while on a boat, and there is wine available…? When : Saturday night, September 14th 2019. A big thank you to Shine Your Lyght Events who you can text or call on 0413342705 to get your tickets. Please call ahead to make your booking ph.0477 666 099 All bookings made require a name, contact and how many guests attending, payment is made on the day as your board of the cruise event. Credit Card facilities available on board.